The Gordon Setter's ancient lineage dates back to 1620, but the Gordon Setter Club of America wasn't formed until 1891. The Gordon Setter first started to hunt game birds in the U.S. almost 200 years ago. 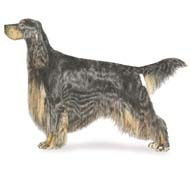 The dark coat of the Gordon Setter aborbs heat very quickly, so owners should watch for signs of overheating while in the fiedld. Gordon Setters are protective of their family and children but are not aggressive unless they, or someone they love, is being threatened. They love a good long run, but daily walks will suffice if field time is not available. General Appearance The Gordon Setter is a good-sized, sturdily built, black and tan dog, well muscled, with plenty of bone and substance, but active, upstanding and stylish, appearing capable of doing a full day's work in the field. He has a strong, rather short back, with well sprung ribs and a short tail. The head is fairly heavy and finely chiseled. His bearing is intelligent, noble, and dignified, showing no signs of shyness or viciousness. Clear colors and straight or slightly waved coat are correct. He suggests strength and stamina rather than extreme speed. Symmetry and quality are most essential. A dog well balanced in all points is preferable to one with outstanding good qualities and defects. A smooth, free movement, with high head carriage, is typical. Size Shoulder height for males, 24 to 27 inches; females, 23 to 26 inches. Weight for males, 55 to 80 pounds; females, 45 to 70 pounds. Animals that appear to be over or under the prescribed weight limits are to be judged on the basis of conformation and condition. Extremely thin or fat dogs are discouraged on the basis that under or overweight hampers the true working ability of the Gordon Setter. The weight-to-height ratio makes him heavier than other Setters. Proportion The distance from the forechest to the back of the thigh is approximately equal the height from the ground to the withers. The Gordon Setter has plenty of bone and substance.